TSV's Top Five Venues in L.A. 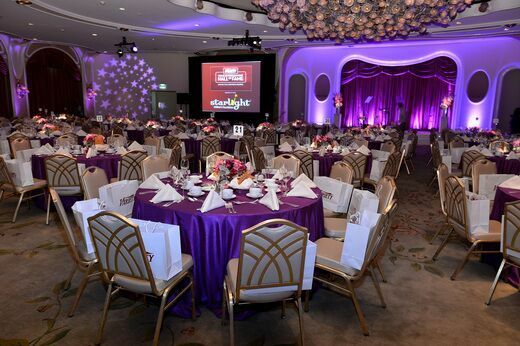 The TSV team loves having a location in L.A. and getting to produce events at many different venues. Here are a few of our favorites that we work with! One of LA's most iconic hotels, also known as the "Pink Hotel" for its art deco decor, the Beverly Hills Hotel is located on Sunset Blvd and is closely associated with Hollywood film stars, rock stars and celebrities. Its Crystal Ballroom, the largest on the property, features a built in stage and some of the most beautiful glass flower chandeliers in all of Los Angeles. With french doors that overlook the Crystal Garden, and a scalloped mezzanine that allows for all front of house production to cleanly tuck out of the view of the event guests, it is one of TSV's favorite locations for event production. The space easily supports two matching screens for video content while still leaving an ample stage for a band or event speakers. LED lighting of the beautiful wall sconces and the spectacular chandeliers allow the space to be transformed to an impactful saturated color experience. Opened in 1955, the Beverly Hilton may be best known for hosting the Golden Globe Awards annually in its International Ballroom. The hotel features over 150 red carpet events annually in over 65,000 square feet of upscale indoor and open air event space. 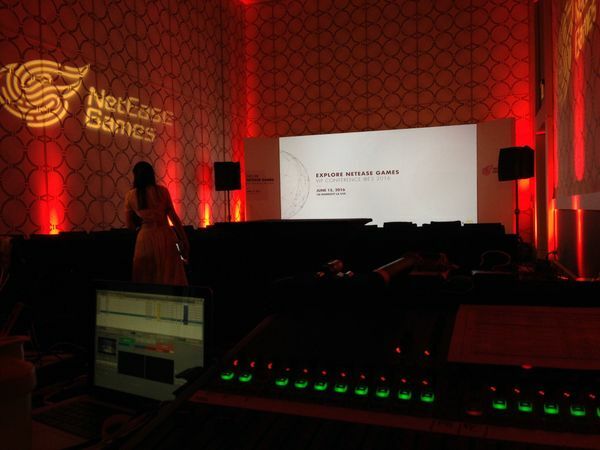 No matter the size of the event, our team has creative A/V solutions that utilize the many event spaces in the hotel. We can fly full line arrays and lighting rigs for larger events or put powered speakers in the many outdoor spaces for a small band. 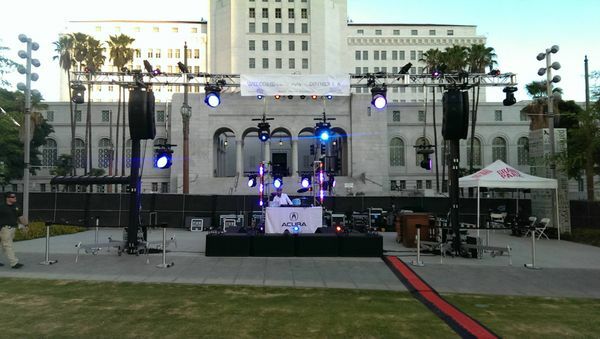 In the heart of downtown Los Angeles you will find the 12 acre Grand Park. Nestled at the feet of City Hall, it provides picturesque views of the downtown cityscape, yet is a green reprieve from the concrete and brick of the city. This juxtaposition creates a very rare opportunity for creating a memorable event! With ample power available across the park, your production possibilities are endless! Full stage and flown lighting truss make concerts a favorite at this location. 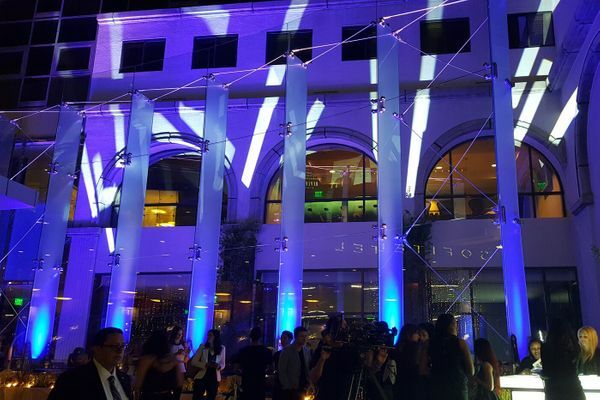 With moving LED light fixtures playing off of the City Hall and surrounding skyscrapers, it becomes an immersive lighting experience. A LED video wall of ANY size can be used to display company logos or be a high impact backdrop for a DJ or band. This is an LA must see! One of LA's newest and largest hotels, the JW Marriott Los Angeles LA Live is nestled in the activity of downtown LA. Located near the LA Convention Center and the Staples Center, the JW Marriott boasts 14 event rooms with over 76,687 square feet of total event space. A huge facility with endless possibilities! Opened in 2010, it has ample power and was designed with large events in mind. If you really want to wow your clientele, this is the space for you. From large corporate events to full on concerts, this property is designed to support large scale events. Fly lighting truss to keep stage lighting out of the eyes of your presenters. Large format projection screens up to 12'x20' ensure that even the guests in the back of the room can clearly and legibly see presentations. 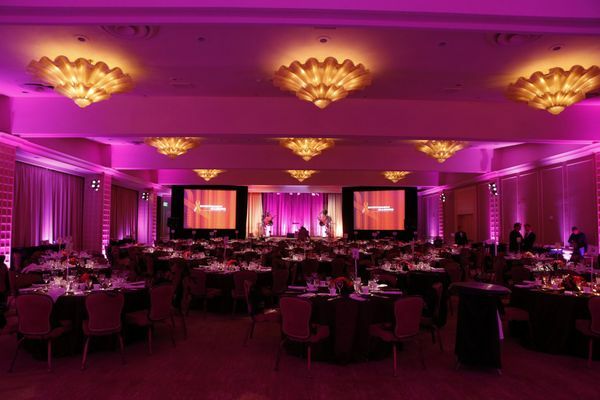 Scenic elements like stretched fabric and plexi columns dress the stage to make your event especially memorable. Additionally, there are plenty of entertainment choices for your guests after a long day of presentations! On the other end of the size spectrum from the JW Marriott, Sofitel Los Angeles At Beverly Hills is a small boutique hotel located across the street from the Beverly Center and has views of the Hollywood sign. What they lack in size they make up in style! Meticulously designed modern decor makes any event here one for your guest’s Instagram account. With a beautiful outdoor area and two bars with performance spaces, we can make a huge impact in a small package. Using LED lighting to create immersive atmospheres, and video mapping to make walls, bar tops and pictures come to life with impressive video content, any party here will be one that your guests remember! We look forward to working with these venues again and are always looking to work with new locations as well! Call us for your next event!